This giveaway is now over. The winner is Bunny. Congrats! I am a fan of Pillsbury products which is why I was excited to try some products from their Simply line. This line of dough contains zero grams trans fat, no high fructose corn syrup, and no artificial colors or flavors. It is super easy to make (open the container and put into your oven) that my husband even managed to make the Rustic French Bread without any help from me! What surprised me more than that was that this bread tastes homemade. I never would have guessed that this came from a can! It is literally that good. The bread just melted in our mouthes, and I can’t imagine getting any other kind of french bread now. It is really that good! The biscuits were just as good too. Tell me your favorite Pillsbury product! Good luck! This contest will end December 22nd, 2010 at 11:59 PM CST. This giveaway is now over. The winners are Jennifer Jozwiak, Yvonne Butler, and Carol. Congrats! My kids love cookies. Actually, mom likes cookies too; she just doesn’t like all the work that is involved with making them. However, Pillsbury has once again come to my rescue with their new line of cookies. My family and I tried them last night, and I have one word for you: Yum. Seriously yum. 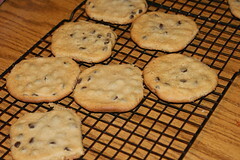 I like quick and easy, and these refrigerated cookies were just that. You literally open the bag, stick them in the oven, and 12 minutes later you have your cookie goodness. It is that easy. Best of all, they are good, and they are good for you. These cookies are made with ingredients you’ve heard of like flour, brown sugar, eggs, and vanilla. You’ll recognize the ingredients on the label. 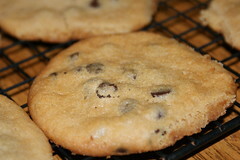 The cookies also have no trans fats, no high fructose corn syrup, and no artificial colors, flavors, or preservatives. The packaging is pretty uncomplicated too — just white with a picture of the cookie on it. It actually sticks out a bit at the grocery store, because it is so plain. These new cookies are available in both chocolate chip and peanut butter. They make a great snack (and even a breakfast, but we won’t tell anyone about that, right?). I’ve arranged with Pillsbury to give 3 of my lucky readers a Pillsbury tote bag. Each tote bag has two coupons in it that entitle you to a free package of Pillsbury Simply . . . Refrigerated Cookie Dough. (Now, if you can’t wait after looking at those yummy pictures, click here and get a coupon for them! 1. Leave a comment on this post. What is your favorite thing about these cookies? Is it the flavors? The fact they use ingredients you can actually pronounce the names of? 3. Add this post to social media sites like Stumble, Digg, Kirtsy, Blogging Zoom, Reddit, Propeller, Etc. Good luck! This contest will end August 30, 2009 at 12:00 PM CST.